Every parent knows that the experience of raising children changes us profoundly, in ways often unforeseen. And yet never before has a book examined how and why the stages of our children's development affect us so deeply, altering not only our jobs, our lifestyles, and our relationships with our spouses and parents, but the very essence of how we think of ourselves as individuals and adults. For the first time, parenting experts Barbara Unell and Jerry Wyckoff offer a new vision of the family journey -- what it means for us as parents and individuals as we evolve in tandem with every new change brought about by our children's growth. Like Passages, Gail Sheehy's groundbreaking study of the stages of adult maturity, this book defines for readers the eight clear stages of an adult parent's life, illuminating the defining moments, key conflicts, important lessons and signposts of each stage of his or her evolution, from early parenthood to old age. These eight stages are fixed at the birth of every child. Try as we might to fight this law of human nature, we all follow the same predictable, inevitable, universal, and eternal journey of parenthood with each child. Once your baby is born, there's no turning back. 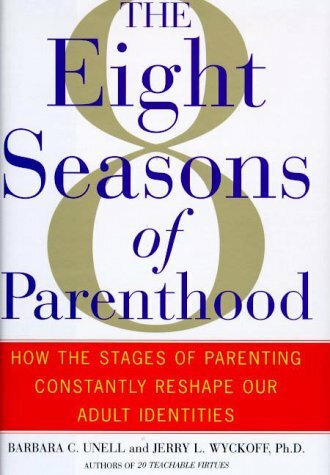 Based on interviews with hundreds of parents from their twenties to their nineties and Dr. Wyckoff's practice as a family psychologist, The Eight Seasons of Parenthood is a compassionate guide and road map to one of life's most profound and never ending experiences . . . essential reading for any parent who has ever wondered, "What's happening to the me I used to know"